If your water supply contains iron, you may have some or all of the following problems: laundry with rust spots or entire garments with a yellow or pink cast, household fixtures with rust deposits, drinking water with a metallic taste, coffee and tea slightly off-color and/or off-flavor and dishwasher with a brown deposit on lining or a brown film on glassware. There are two sources of iron or rust in household water supplies: the water itself and the water pipes. In addition, iron bacteria are increasingly becoming a problem in the water supply in some areas in Oregon. Water, particularly well water, may contain dissolved iron. As water goes through the earth it dissolves iron from iron-bearing strata. If dissolved iron is the source of iron in your water supply, the water will generally appear to be clear when it is drawn from the faucet, but may turn rust-colored shortly afterward. Ordinarily the iron in well water is dissolved as ferrous bicarbonate, which is colorless. After standing or when heated, this water becomes cloudy and then a reddish sediment appears. When the colorless iron compound is exposed to oxygen in the air, it is converted to ferric hydroxide, which is red in color and will gradually settle out of the water as a sediment. The pipes which carry water from the community water system or the private well to the point of use in the home may also be a source of iron. If the water is acidic in nature, (a pH value under 7 is an indicator of acidity), it can cause plumbing to rust or corrode. 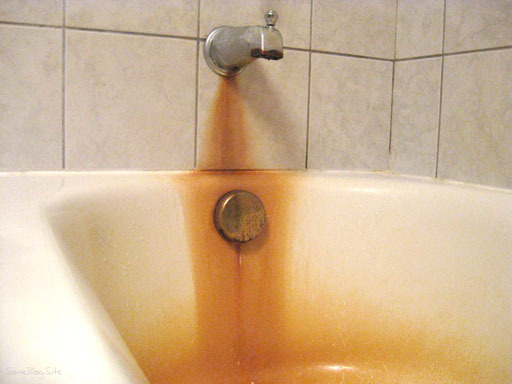 If the pipes are the source of iron in your water supply, the first water drawn from the faucet may appear rusty. After the water has been allowed to run for at least two minutes it should run clear. You can tell if iron bacteria are present by removing the top of the toilet tank and checking for a rusty, slippery, jellylike substance deposited on the sides and bottom of the tank. If it is present on the tank walls, this is an indication that at least a portion of the iron content in your water supply is being caused by bacterial action. Iron from this source will not cause particles to settle to the bottom of a jar of water. At one time, it was generally accepted that iron bacteria "ate" the iron and steel parts of pipe and equipment because these parts become etched and corroded when iron bacteria are present. It has since been found that iron bacteria act on the iron that is already in the water. The etching and corrosion are caused by other water conditions. Iron bacteria thrive under these same conditions. Two types of problems may occur when water containing iron is used in doing home laundry. Both problems are most noticeable on white or light-colored fabrics, but the iron actually affects all colors of fabrics. Some fibers, nylon for example, are more susceptible than others to iron discoloration. The first problem is gradual yellowing of items after several washings. This occurs when the soluble form of iron is gradually oxidized (exposed to oxygen) during the laundry process. This process is called aeration. If iron is present in the water, it will oxidize during the laundry process. As the iron oxidizes it precipitates (forms particles which are no longer dissolved in the water) and becomes fixed on the closest available fiber in the washing machine. Because the washer agitates items through the wash water, all items in the wash load are exposed to about the same amount of iron as it precipitates out of the water, thus the overall dulling or yellowing of items washed. The second problem is caused when chlorine type bleach is added to the wash water containing iron. Chlorine bleach is an oxidizing agent --- it adds oxygen molecules to the iron particles in solution in the water. Because chlorine bleach is a strong oxidizer, it causes more iron to precipitate out of the water than naturally occurs with aeration. The iron precipitated by chlorine bleach can cause noticeable yellow or rust-colored spots on items in the wash. If you have iron bacteria, there is only one effective treatment, chlorination and filtration. Neither ion-exchange units nor iron filters will be effective if the iron is bound into organic matter, if iron bacteria are present, or if the iron concentrations are high (over 10 mg/L _- milligrams per liter). Iron bound into organic compounds is not available for removal by ion-exchange, and these compounds often pass through ion-exchange units and filters with no significant removal. Similarly, iron bacteria can foul ion-exchange units and filters rapidly. Even when removal is satisfactory part of the time, high flow rates may cause slugs of dirty water to appear in the treated water. If the iron is from non-bacterial sources, any of the treatment methods can be used. A chlorinator and filter will take care of any quantity of iron present in any of the forms: dissolved, particulate, and bacterial. The chlorine oxidizes the iron so that rust particles precipitate out of the water. Where iron bacteria are the cause of iron in the water supply, chlorine will kill them and protect the system from further attack. A filter strains out the iron particles and/or dead iron bacteria and provides clear water at the faucet. For a chlorine unit to be most effective, it is important that the water contain little or no acid. If acid is present, pH adjustment before the water enters the chlorinator is necessary. An ion-exchange zeolite unit is used for water that has not been exposed to air, causing iron particles to form. Under these conditions, ion-exchange units can be effective for treatment of water containing up to 10 mg/L of dissolved iron. There is a wide selection of zeolite minerals, some of which will remove iron on an ion-exchange basis in the same manner as calcium and magnesium are removed in a water softener. Or, the zeolite minerals will remove iron along with calcium and magnesium as part of the softening process. If your water supply has been checked for iron content, a manufacturer of water-conditioning units can take the information and select the zeolite needed for your water supply. The unit will look like a water-softening unit, so there is no way of telling from the outside appearance whether a softener will handle small quantitites of iron or not. If your water supply has been exposed to air and already contains iron particles," they will be fi1tered out on top of the zealite bed as the water moves through it. They are quite difficult to remove. The reason --- the iron particles are heavier than the zeolite. When you attempt to backwash the zeolite bed with a heavy flow of water, the zeolite particles move more readily than the iron particles. If you leave the iron particles in the zeolite bed, they will accumulate until they bleed through the bed. Also, the bed will become fouled until it loses its ion-exchange capacity. Once the zeolite bed reaches this condition, it is possible to get a pellet type salt containing a substance which dissolves the iron and rust accumulations. If you have a situation where part of the iron is forming into particles, use an oxidizing filter (next discussion). It is designed for both dissolved iron and iron particles. The ion-exchange units are serviced in the same way and with about the same frequency as water-softener, ion-exchange units. Iron-removal (oxidizing) filters are used for removing up to 10 mg/L iron. The iron-removal filter unit looks much like a water softener, but the material contained inside is a type of oxidizing material, usually manganese-treated greensand. The manganese provides oxygen which causes the iron to precipitate out as rust particles. If some iron particles have formed before the water reaches the fi1ter, they are al so filtered out by the mineral bed. The fi1ter must be backwashed periodically to flush out the accumulated deposits. Potassium permanganate is added to recharge the filter mineral with oxygen.